Standard Tire and Rim Size For Moped and Matic Race - In asia, moped and matic race is a populer sport. Asia has many brands moped and matic motor cycle. Its different with europa that prefer sport bike than moped. 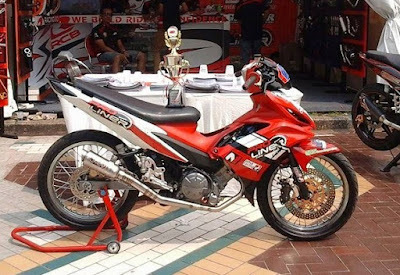 Have you seen a moped or matic race before? Did you know what size of tire that they use? standart tire size for matic or moped is 90/80 front and rear. And the size of rim is 1.60 front and 1.85 for rear. And tipe of tire is racing use only, what is different tire for racing use only and tyre from daily use only? Tire for racing use only made from special compound and special stucture. So tire for racing use only can sticking on the track with better. thare are 3 tipe of compound, there are soft compound, medium compound and hard compound. Tire for racing use only usually easy to exhausted. Tire for daily use only made with hard compound and it has hard structure. So its more durable than tire for racing use only. Yamaha Jupiter MX, 135LC, Spark, Exciter. 0 Response to "Standard Tire and Rim Size For Moped and Matic Race"